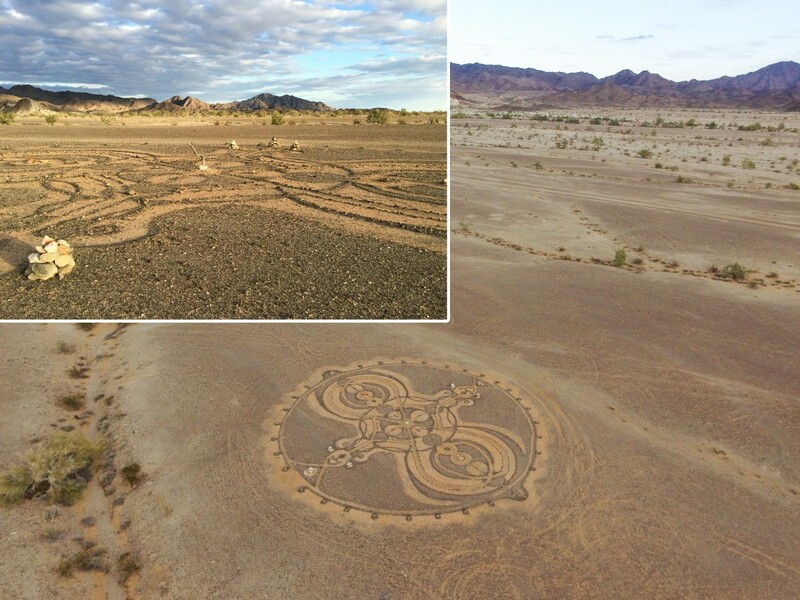 above: desert art at eye-level (top-left) isn’t fully appreciated until viewed from above with a drone! Being back in the Southwest meant we could finally put our solar panels to use! On the east coast and much of the south, the dense population and lack of open public land makes it almost impossible to find any free land to camp on. 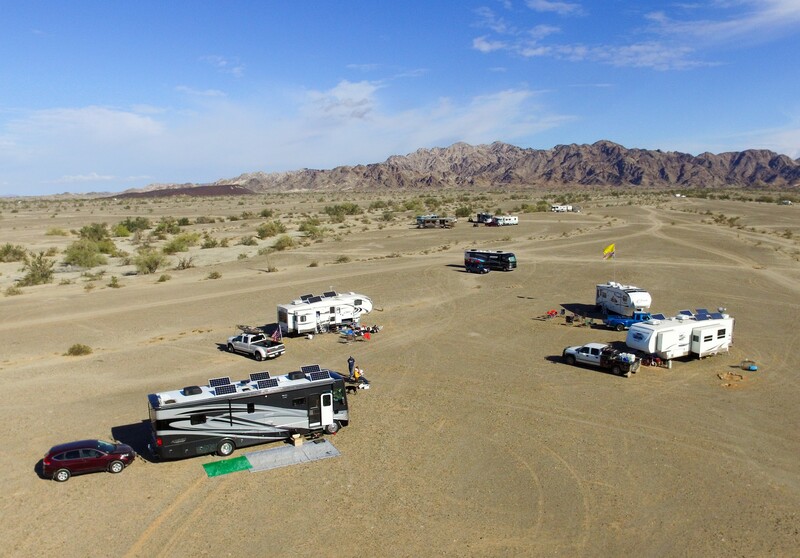 The Southwest and west coast contain huge tracts of empty land managed by the Bureau of Land Management (BLM) that campers can use for free or for a nominal fee. There are no regulated camping spots, you just roam around the area, find a spot that works for you (preferably away from other people), and set up camp. RVers call this boondocking or dispersed camping, and you set up in a remote area with no hookups (no water, sewer, or power). 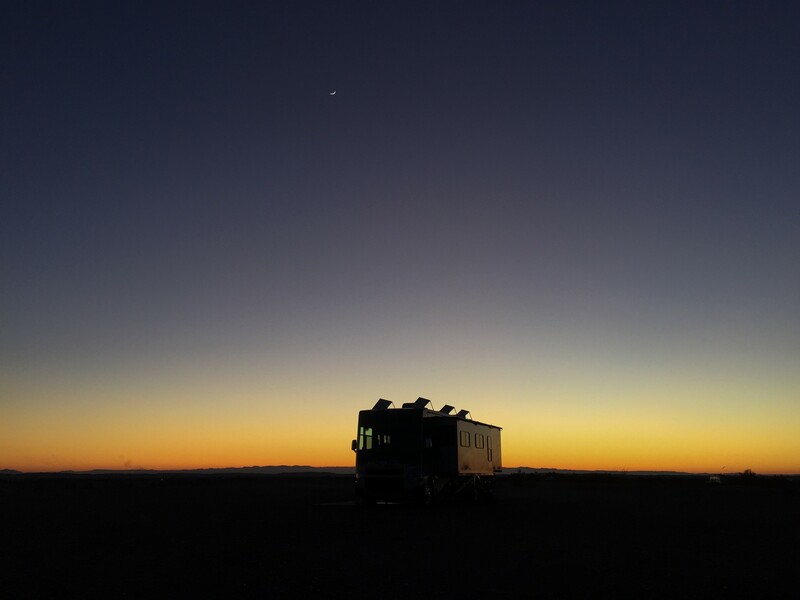 Rover after sunset in the lonely desert. While some things in our RV (like our lights, fans, and furnace) run on the 12 volt power from our house batteries, other things (like our refrigerator, microwave, and laptops) need regular household 120 volt power. An inverter converts our 12 volt battery power into 120 volt household power so we can use those appliances. While we had our solar panels to recharge our batteries, we only had the basic inverter that Tiffin installed into our coach, so we bought an upgraded inverter that would better meet our needs. The inverter installation required a lot more electrical work than we were comfortable with, so we decided to find an installer. 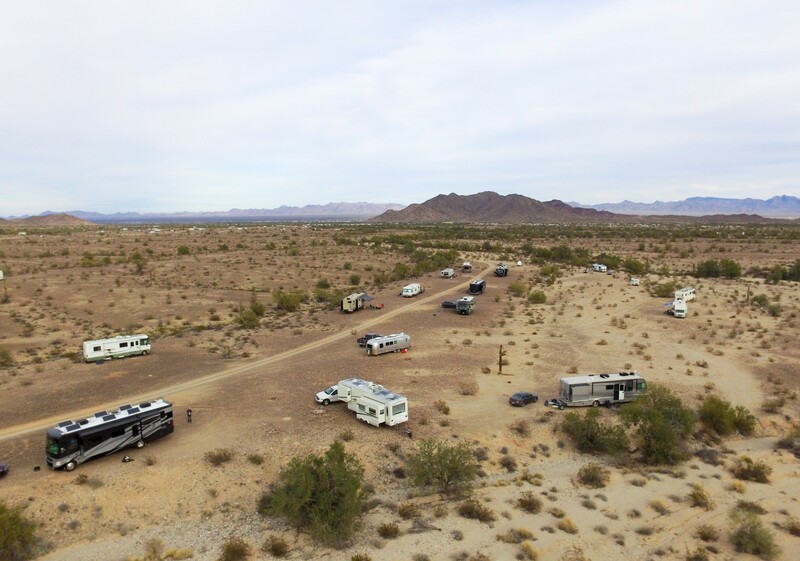 We headed to Olgilby Road right outside Winterhaven CA (near the borders of CA, AZ, and Mexico) to meet up with Eddie, our inverter installer, and a small group of boondockers from RV Happy Hour. Last year when we boondocked, we had to use our generator a few times a day for 1-3 hours to keep our batteries recharged. With our new solar setup, we can make it through the day without running the generator if it’s a cloudless sunny day (and if we don’t go too crazy with electronics). With less sun, we run the generator an hour or so in the morning to give the batteries a big boost before the solar takes over. I’m tickled pink that just hanging out and catching rays gives us enough power to live comfortably in Rover. Of course using the oven or air conditioners is out (unless the generator is running), but we can do just about anything else, including using the tv, sewing, recharging our electronics, and keeping our refrigerator going. I understand the concept of solar power but to see it in use is pretty darn awesome. 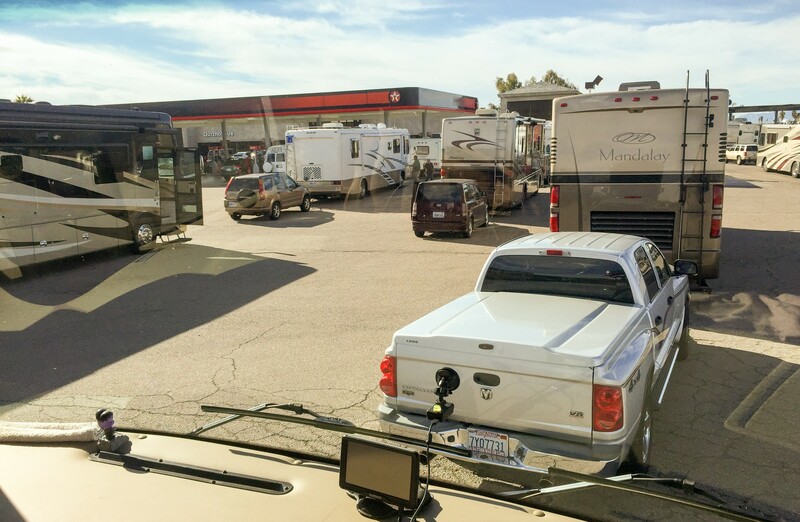 Stopping for gas near Quartzsite means waiting in a long line of RVs! After Olgilby, we joined the tens of thousands of other RVers migrating to Quartzsite AZ for the yearly RV show. 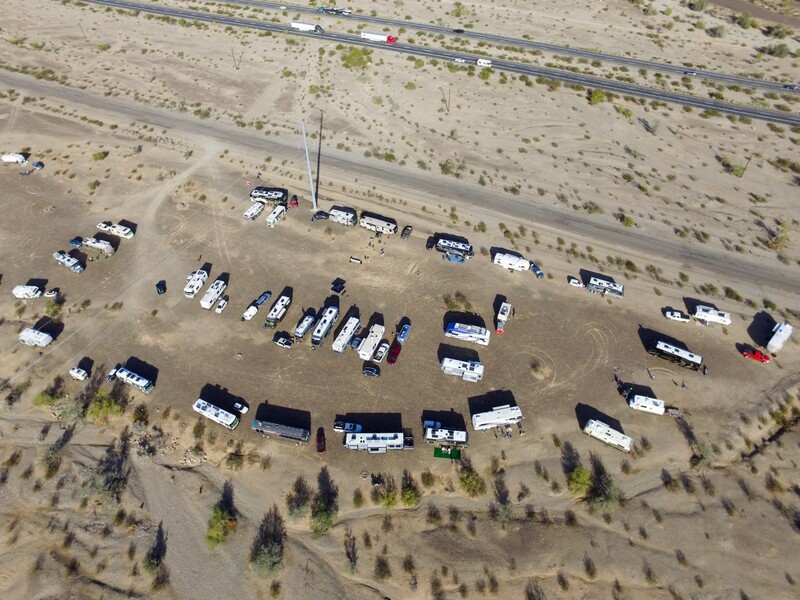 This year, we met up with the Xscapers Convergence near I-10. Xscapers is a new branch of the Escapees RV Club catering to the younger, still working crowd. It was great to meet everyone but our location was pretty cramped and the noise from I-10 was loud, even at night. The Xscapers Convergence, with I-10 visible in the top-right. After the official convergence, a few folks scouted out a larger area further away from civilization off Dome Rock Rd. a bit west of Quartzsite. A dozen or so Xscapers decided to migrate to the new site. This is where it got a bit ugly for us. On the way to the new site, we ended up with a very sharp stick stuck in Rover’s back tire and we were losing air quickly! We pulled off into a small gravel area just off the road where a different group was already camping. They thought we were crashing their party until we explained our predicament. Unfortunately since it was Sunday, all the tire shops were closed and the nearby Love’s Truck Stop only sold tire trucks. That meant setting up camp where we were and waiting until Monday for resolution. Our outer rear passenger tire being replaced. On Monday, we found Pete’s Road Service as we were driving around in our car. They come to Quartzsite every year during the show to sell/change RV tires. Most of their work is replacing all the tires on older RVs but they were more than happy to come out and change our tire (no charge to come to us). They were super awesome and by Monday afternoon we had joined the Xscapers crew at the new “Xscampment” site. Our quieter, more spacious site at the Xscapers Xscampment. I think the best parts of boondocking are the cost (free or almost free), the privacy, and the ability to walk Opie anywhere. I find the hardest part of boondocking is the water rationing. At some campgrounds where we conserve water, we use their shower facilities but we don’t have that option when boondocking. Navy showers and “huggies baths” (using baby wipes to clean ourselves) are a necessity to save on water and gray tank space. 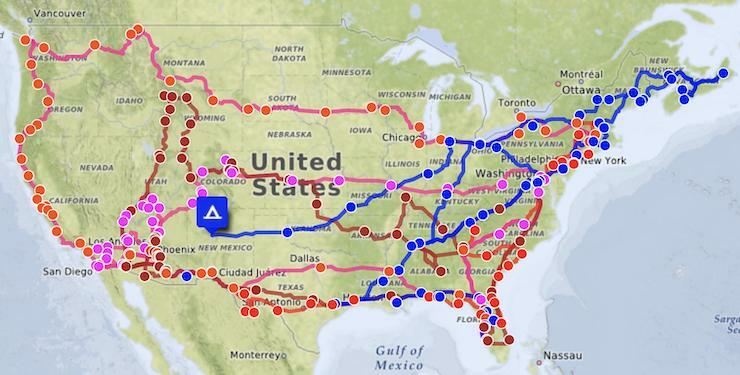 For me, the sweet spot for boondocking is about 7-10 days. After that, I start looking forward to LONG HOT showers and unlimited electricity. 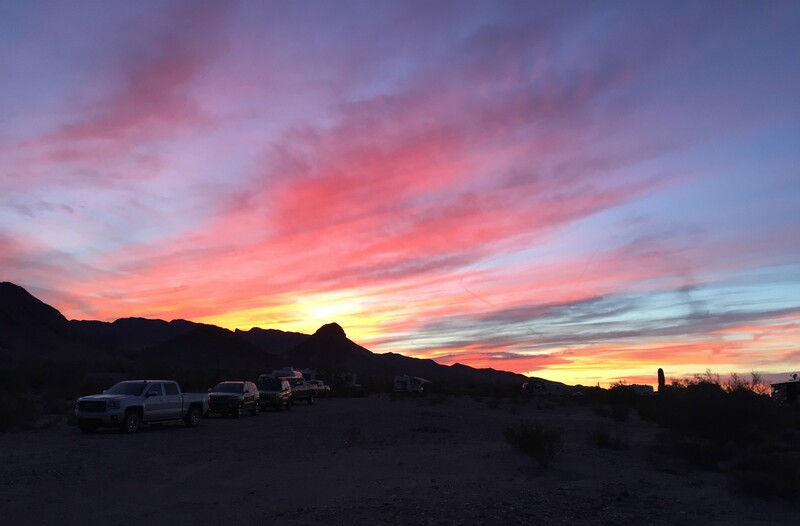 Quartzsite is known for its stunning sunsets. I’ve been following you for a while and enjoying your posts detailing the lifestyle and travel routes you’re taking. They are similar to ours, and it’s been interesting to read about your boondocking experiences, which we hope to get into a little more this year. 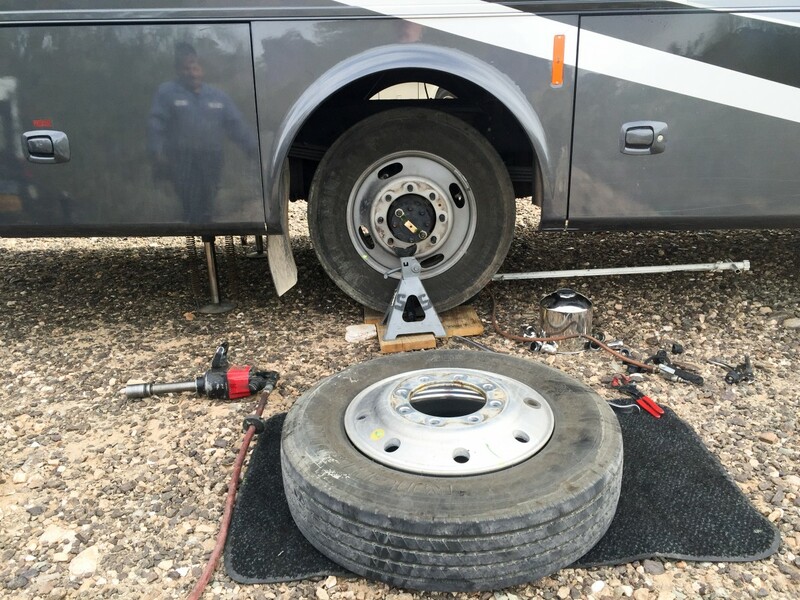 This post about Quartzsite brings back fond memories, minus the flat tire – what a bummer! Best of luck in your travels, and maybe we will cross paths down the road and enjoy a happy hour together. Hi! We’ve actually been reading your blog too! 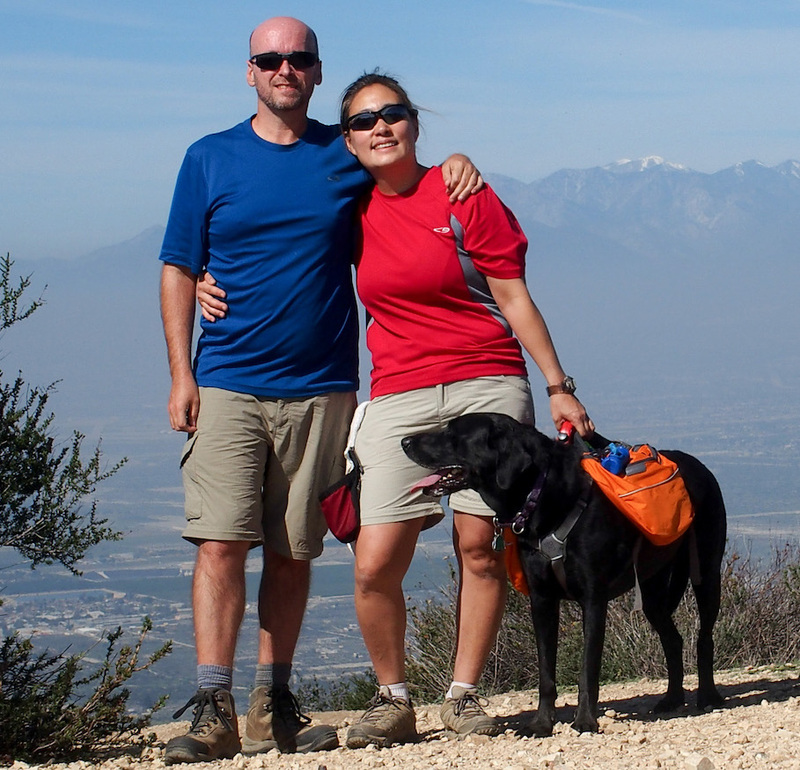 We found your blog when we first started on our adventure and were struck by the similarities of our situations. I’m definitely curious to know what your plans are after this year. I do hope we end up crossing paths this year. 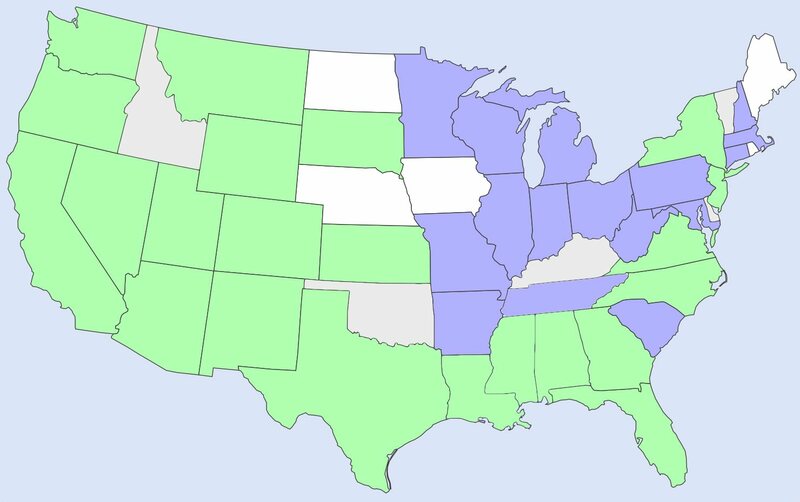 We’re going to be in the same general area but I think our timing might be a bit off unfortunately. With luck, we’ll be able to meet up and exchange stories and have a few drinks! Really nice drone video! What did you replace your inverter with? Did you add any batteries? Thanks, Mike is enjoying the drone flying and he keeps getting better. We upgraded the inverter to the Magnum MS2012. Starting with the 2016 models, I believe Tiffin is allowing customers to upgrade to this same inverter in the 36LA. We’re happy with it so far. If you plan to upgrade your inverter (and you plan to boondock), we’d recommend it! We haven’t upgraded to lithium batteries yet, but it’s definitely on the radar. We just spent 3 weeks boondocking in LaPosa LTVA BLM, 1 week in Imperial LTVA near Yuma and a couple days in BLM on Darby Well Rd in Ajo. Now were in Surprise, AZ for the rest of the month while we have some work done on the rig. I’m with you, I just enjoyed my first LONG shower in a month! Looks like you’ve had fun except the tire! Where are you guys now or going next?